Predictions on the efficacy of marine reserves for benefiting fisheries differ in large part due to considerations of models of either intra- or inter-cohort population density regulating fish recruitment. Here, I consider both processes acting on recruitment and show using a bioeconomic model how for many fisheries density dependent recruitment dynamics interact with harvest costs to influence fishery profit with reserves. Reserves consolidate fishing effort, favoring fisheries that can profitably harvest low-density stocks of species where adult density mediates recruitment. Conversely, proportion coastline in reserves that maximizes profit, and relative improvement in profit from reserves over conventional management, decline with increasing harvest costs and the relative importance of intra-cohort density dependence. Reserves never increase profit when harvest cost is high, regardless of density dependent recruitment dynamics. 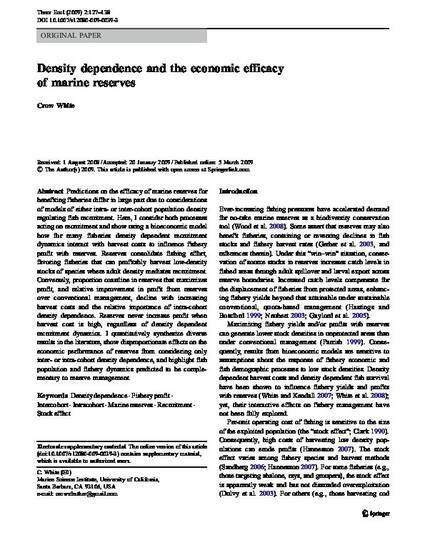 I quantitatively synthesize diverse results in the literature, show disproportionate effects on the economic performance of reserves from considering only inter- or intra-cohort density dependence, and highlight fish population and fishery dynamics predicted to be complementary to reserve management.